This exhibition catalogue is published on the occasion of Vietnamese artist Dinh Q Lê’s inaugural Australian exhibition at Sherman Contemporary Art Foundation featuring a newly commissioned multi-media installation and online archive–erasurearchive.net–that draws on recent debates in Australia concerning refugees and asylum seekers. Dinh Q. Lê is considered one of Vietnam’s most significant contemporary artists. Born in Vietnam in 1968, Lê moved to Los Angeles with his family in 1979 after fighting erupted between the Vietnamese and the Khmer Rouge near their village at the Cambodian border. 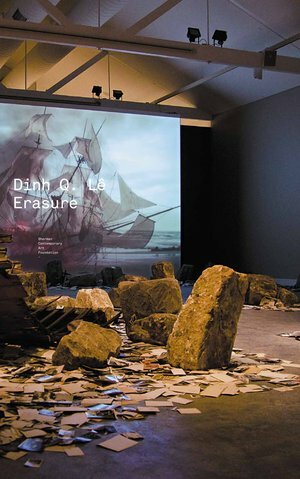 As a refugee himself, Lê was motivated to produce Erasure by the tragic sinking of an asylum seeker’s boat off Christmas Island in December 2010. Layered and fragile memory is at the core of Lê’s work. His practice challenges how our memories are recalled and how society archives the evidence of human suffering. Lê’s work elucidates his commitment to the artistic process as a means of excavating history and the uncovering and revealing of alternate ideas of loss and redemption.